N.Y., Boston Chicago: Silver Burdett Company, 1900, 1900. Hard Cover. 7 1/4 x 5. 136 pp. Edited by Joseph B. Seabury. 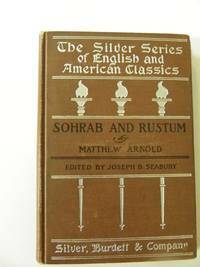 Matthew Arnold's Sohrab and Rustum and other poems. Lengthy intro by editor. Excellent notes, also by editor. This is an exquisite old copy of Matthew Arnold's work. Bound in dk brown cloth on boards and profusely decorated with silver gilt lettering and torch motif. Endpapers are old ivory colour. Light penciled former owner's name. Cove r has min wear to edges. Min scuff on rear cover. Photo of Matthew Arnold on Frontpiece. In addition to Sohrab and Rustum, there are 21 other poems. Text is tight and very clean. Overall cond: v. good ..
Hamilton Ontario: Tree House Press Inc, 1990. 35 pp. A handbook for young authors, Primary Division. Many words students will use in their writing. Places students can add new and interesting words they find. Many story starter ideas. Contents include: How to Study New Words, kMathematic Words, Common Homophones, Abbrevitions, Days, Months, Numbers, Common Contractions,k Using suffixes to build words, Editing Checklist, Learning to us nonsexist language, printing models. Softcover has some scrapes on front at bottom. possibly where the price sticker was, min. scuffing, min edgewear. Stapled spine in good shape. No former owner's name. No writing in text, very clean. Short, useful and to the point. A good copy.. Soft Cover. Very Good. 11 x 8 1/2.